Paneer is a very versatile and tasty ingredient vastly used in Indian cooking. I love Paneer and the creamy deliciousness it brings to any dish. I use them in curries, in biryanis, in sweets and now even in appetizers. You can make your own Paneer, its easy or you can use store-bought Paneer. 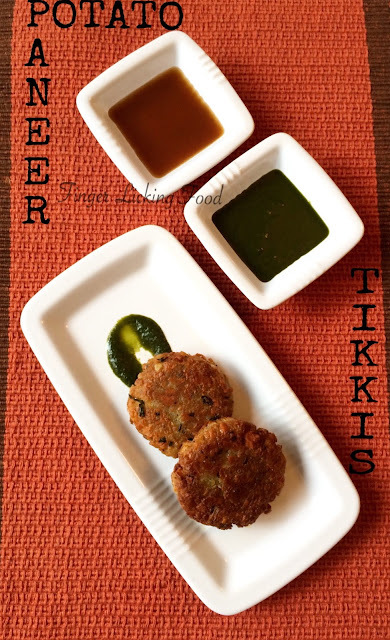 Either way you will have one piping hot tikki to wow your taste buds! Cover potatoes with cold water in a large pan and set on medium high heat. Cook until fork tender – meaning a fork goes into it easily without much effort. Do not over cook them. Remove from heat, drain the water and cool completely. Peel and grate them into a large bowl. I prefer to grate the potatoes than mash them, it doesn’t affect the texture of the tikki as such its just my personal preference. You can mash it too. Add the grated paneer and all the ingredients listed above except the oil. Taste to check for seasonings and adjust accordingly. Combine well and form into patties. At this point you can chill the patties for an hour or two before you cook them or you can shallow fry them right away. Heat a wide non-stick skillet on medium heat. Pour about 3 tbsp of oil. Place 4-5 patties at a time and allow to brown and crisp up. Cook for about 2 minutes on each side and remove on paper towels to drain excess oil. Serve hot or warm with mint chutney or ketchup. These are finger licking good so be sure to make plenty, they go fast! !